The Legend of Zelda Producer Eiji Aonuma has a lot of impressive games on his resume, namely every single Legend of Zelda game since Ocarina of Time. 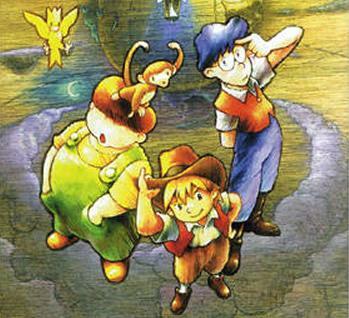 However, the game that put him on Nintendo’s Shigeru Miyamoto’s radar was a fabulous little adventure title called Marvelous: Another Treasure Island. Fans have eagerly been wanting to play this game for two decades, and now they finally can. A complete fan translation has just been released for the first time by translator DackR. Other fan projects have attempted to make the game playable in English before, but none have followed through all the way. This newest translation is the complete version of a previous attempt by translator Tashi, whose 2012 translation was the closest we’ve ever gotten to total completion. That’s the one I played until I hit the brick wall. Good to know that it’s finished so I can go back. Marvelous: Another Treasure Island combines the exploration of older Zelda titles with the puzzles of a classic point-and-click adventure, and it’s every bit as fun as it sounds. Players control three friends who stumble across a conspiracy at their summer camp, and they must combine their unique abilities if they want to survive. North American fans were first introduced to it in Nintendo Power, but it was never translated for our consumption. Just another game to throw onto the old backlog. You’ll have to resort to back alley means to play it, but that’s fine considering there is no other way to do so.